The final minute of UNC's Elite Eight win over Kentucky was sheer mayhem. The Tar Heels led by six with a minute left, and then Kentucky's Malik Monk nailed a three to bring the Wildcats within three. On the other end, Carolina missed the first free throw of a one-and-one, and then Monk drilled another triple to suddenly tie the game with seven seconds left. UNC raced up the court, the ball somehow landed in the hands of sophomore Luke Maye, who drained a jumper to give Carolina the lead with 0.3 seconds left. Here, for your viewing pleasure — or pain — is a video of Kentucky fans at a bar watching and reacting to the final minute of action. In less than 10 seconds, Kentucky fans go from losing their minds in celebration of Monk's game-tying three, to sheer dejection when Maye's jumper falls. And like any piece of great art, you can watch this an infinite number of times and find something (someone) new to focus on. The video from the Kentucky bar, really, is March Madness in all its glory. 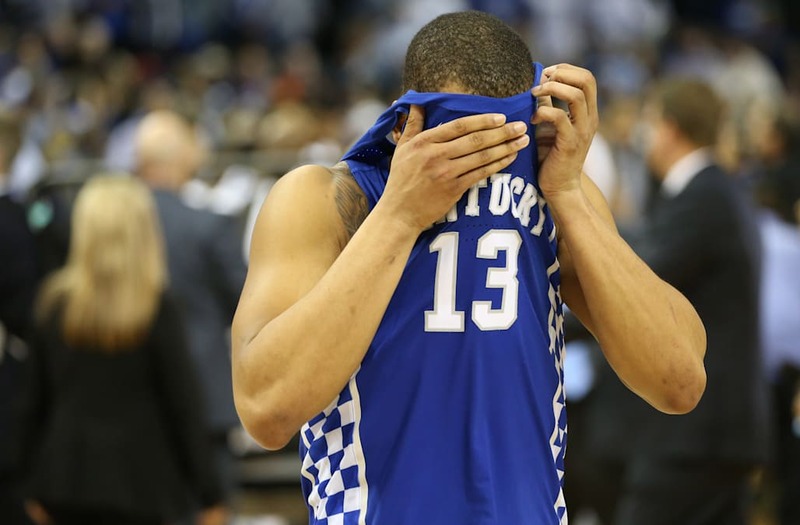 Both the ecstasy and — for Kentucky — the agony.